This article is Round 4 of the Underdog’s Corner, a series spotlighting various lesser-used commanders and their place in the format. Each article makes the argument for a single commander that deserves more play, as well as highlighting key cards and synergies. The bell has rung, and we’re back in the ring with this installment of the Underdog’s Corner! One thing I noticed after the first three articles is that all the commanders so far contained blue. To those who don’t know me personally, blue actually isn’t my favorite color. I’m sorry to have misled you with my articles’ bias. Along with this change, our newest underdog is going to explore a color yet to be seen in the series: black. Ladies and gentlemen, with a face only a mother could love, meet Sek’Kuar, Deathkeeper! 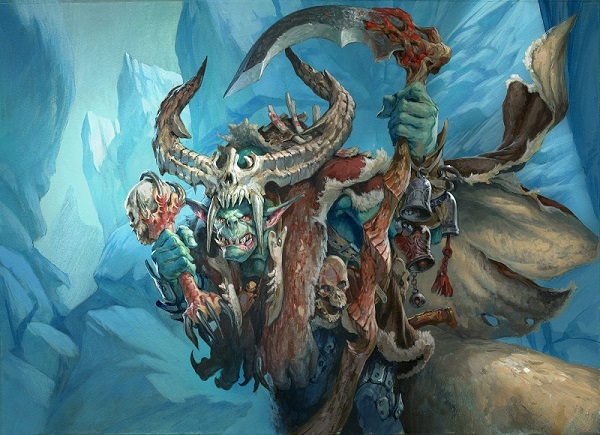 Coming in as only the 5th most played Jund commander, our red, green, and black Orc Shaman was probably beginning to think he was permanently left out in the cold. First appearing in Coldsnap and then again in Commander 2013, Sek’kuar has always competed with other more obviously powerful commanders. In Coldsnap, our orc general had to compete with the likes of Zur the Enchanter, Arcum Dagsson, and even Darien, King of Kjeldor. Then, when he was reprinted he had to stand against Prossh, Skyraider of Kher. Looking at those legends, it’s easy to see how he struggled in his own weight class. I personally didn’t really give Sek’kuar a hard look until recently. That’s not his fault; most Jund commanders haven’t interested me. When I started re-reading his card lately, the wheels started turning in my mind. How can we use this guy to full potential? What am I missing? At first glance, there are a couple of limitations that stuck out to me that hindered my outlook. This line is what has always discouraged me quickly from giving Sek’Kuar a closer look. 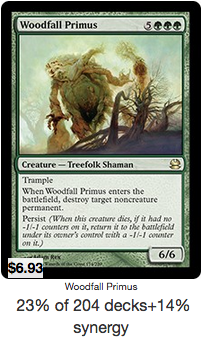 I love creature tokens as a general rule, and seeing text that reads “nontoken” throws up a caution sign for me. Along with that, Sek’Kuar specifies that another creature has to die to get a Graveborn token, which means that our general won’t replace himself with a token. I guess everything can’t work out how we want it. As I started brewing, I couldn’t get over his limitations. Every obvious option quickly got nixed because the interaction either produced a creature token, or the recursion element was anti-synergistic, such as Unearth. However, the more I dug into Sek’Kuar, the more possibilities I found, and I began to get more and more excited about his potential. As we noted earlier, Sek’Kuar’s ability specifically requires that nontoken creatures die. This can take us in two different directions. The first and most obvious is looking at other cards that benefit from nontoken creatures dying. If our deck list is geared towards taking advantage of nontoken creatures from the beginning, we can start to include other cards without making sacrifices… yet. While there are not that many cards that benefit from having nontoken creatures die, we do get redundancy in the effects. Grim Haruspex and Harvester of Souls both give us draw power to go with our creatures dying. According to EDHREC, each of these creatures appear in about 40% of Sek’Kuar decks. Sifter of Skulls and Pawn of Ulamog can stay on the board and allow us to replace our creatures when they die, while Caller of the Claw and Vile Redeemer can be held in hand to allow us to replace our creatures with bear tokens and eldrazi scions respectively when required. One interesting thing to note is that Sifter of Skulls and Pawn of Ulamog both appear in Sek’Kuar’s signature cards, while Caller of the Claw and Vile Redeemer don’t appear on the page at all. Another card that doesn’t appear on Sek’Kuar’s EDHREC page is Whisperwood Elemental. It’s a card that I’ve always really liked, but I had never found a deck for it until now. Not only does Whisperwood replace each of our dying creatures, but each manifested replacement also counts as a nontoken creature as well, allowing Sek’Kuar to create more Graveborn tokens if need be. To no one’s surprise, a deck headed by a commander who cares about creatures dying should include ways to sacrifice creatures. Free sacrifice outlets are incredibly important, and because of that fact, we will often see the same cards fill that role. Both Evolutionary Leap and Birthing Pod are very common sac-outlets for good reason. Assuming that we have Sek’Kuar on the board, Evolutionary Leap allows us to draw two creature cards for two green mana for each nontoken creature, which is great. 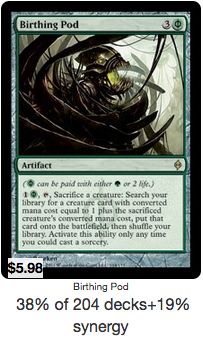 Ashnod’s Altar, while also a common sight, plays a synergistic role in the deck that will be discussed later on. However, for this deck we might want to consider leaning towards using more creature-based sac-outlets, such as Viscera Seer and Carrion Feeder. While those cards allow us to sacrifice for free, I think it’s a mistake to overlook others entirely. Korozda Guildmage has the “nontoken” clause that been prevalent so far, allowing us to creature a mass of tokens. 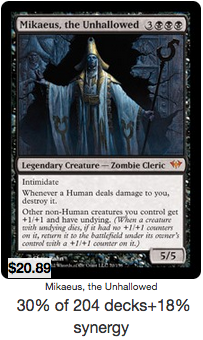 Qarsi High Priest may be an unknown to some players, but I think it offers a very interesting effect. While it does need to tap to sacrifice a creature, the priest allows us to turn tokens into nontoken creatures, which is a unique angle to this humble one-drop. 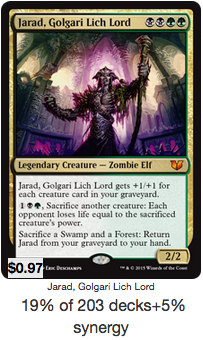 Jarad, Golgari Lich Lord is probably one of my favorite sac-outlets available as he lets us hit each of our opponent’s hard at the cost of a creature. Jarad, while being incredibly potent himself, is also my way of foreshadowing where this deck idea is going to go. Just like Sek’Kuar’s flavor text from Coldsnap suggests, we’re looking for creatures that double as sacrificial lambs. You probably noticed, but I really like the interaction between Sek’Kuar and manifest. Sultai Emissary gives us access to two bodies to sacrifice for Graveborn tokens for a very low cost. Yavimaya Elder and Sakura-Tribe Elder both function as great ways to ramp ourselves while also trading up in stats. We can also make card choices based on taking advantage of our focus on creatures dying. For example using Caustic Caterpillar and Viridian Zealot may be preferred over using Reclamation Sage and Acidic Slime if we’re looking for artifact and enchantment destruction. Sharing is caring, right? 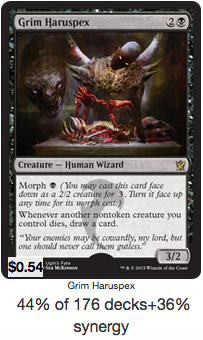 If we’re going to make card choices based on creature’s getting value from sacrificing themselves, why not consider Grave Pact and Dictate of Erebos to share that with our opponents? If our opponent’s are running very few creatures, we should be able to clear their boards while slowly amassing a steady stream of Graveborn tokens as well. At this point we’re throwing creatures into the graveyard fairly often, but how do we take advantage of this? While Meren of Clan Nel Toth on her own is far and away the most popular green-black commander, she is also a perfect inclusion to this deck. With Sek’Kuar specifically, Meren gets two experience counters for each nontoken creature that is killed under our control, and we get to bring back that creature over and over. Even on her own, she’ll function as a Raise Dead effect at worse. Kessig Cagebreakers, Spider Spawning, Svogthos, the Restless Tomb, and the previously mentioned Jarad, Golgari Lich Lord all benefit from counting how many creatures we have in our graveyard. While Jarad and Svogthos are selfish and buff themselves, the other two let us throw quite a number of tokens onto the battlefield if we’re willing to fill our graveyard a bit. Mikaeus, the Unhallowed is one of my favorite cards in all of Magic: The Gathering, and I would be hard pressed to exclude it from a black deck, let alone a deck that is focused on sacrificing creatures. Undying is an incredible mechanic, and giving it to nearly every creature in our deck is even better. It allows us to double dip on all our our creature effects and token creation, but Mikaeus doesn’t stop there and also buffs our field as well. While being an incredibly strong piece on his own, Mikaeus can also form a game-ending combo with a sac-outlet and either Woodfall Primus or Murderous Redcap. While brewing Sek’Kuar, I was trying to think of other ways to take advantage of his ability, and then I thought “What if I animate and sacrifice my lands?” This was the start of a very exciting idea that I didn’t give up on. Man-Lands were the first thing I thought of when considering the idea. Blinkmoth Nexus, Mutavault, and Mishra’s Factory were the first cards I considered due to the low activation cost. But what if we went bigger? What if we went all in? There are several cards that animate all of your lands such as Natural Affinity, Life // Death, and Rude Awakening. Natural Affinity allows you to animate all of your opponent’s lands as well. With enough mana, Kamahl, Fist of Krosa can animate most of the lands on the table as well. Popular legends such as The Gitrog Monster and Titania, Protector of Argoth offer an incentive for sending our lands to the graveyard. If we’re able to consistently sacrifice lands, Titania essentially acts as a second Sek’Kuar, Deathkeeper, while the Gitrog Monster creates a steady supply of card draw. Squandered Resources is one way to individually sacrifice lands that I think is worth inclusion. Combined with effects like Life from the Loam, it lets us create a steady stream of extra mana. If we need to, we can sacrifice all of our lands to make a final push to win. This isn’t our only option to sacrifice our lands en masse though. Scapeshift is probably one of the strongest options available. Not only are we gaining advantage from Titania or the Gitrog Monster, but we are also able to search for key lands such as Nykthos, Shrine to Nyx, Urborg, Tomb of Yawgmoth and Cabal Coffers and put them into play. Devastation and Obliterate allow us to completely reset the board in our favor with a few other pieces on the battlefield. While every other player sacrifices all of their creatures and lands, we can leverage that advantage with tokens from Titania, Gutter Grime, or Vile Redeemer. With the many ways that we have to generate creatures from destroying all of our lands, Cryptolith Rite lets us turn those creatures into our new mana base. While they don’t remove creatures, Epicenter and Keldon Firebombers are also an option. If we decide we miss those lands, Splendid Reclamation allows us to bring all of them back, along with any others that were already sitting in our graveyard. Another option is Crucible of Worlds, which will allow us to slowly rebuild our land base from the graveyard. Remember Mikaeus, the Unhallowed? He’s also great with our plan to animate our lands. Once we animate all of our lands, Mikaeus gives us many options. We can go on the offensive since our lands benefit from Mikaeus’ buff, and we are also able to attack without repercussions as any land that dies as a creature will return as a land. Those lands will also come back untapped which allows us to not lose out on mana. He also can act as a one-shot mana doubler with a free sac-outlet, or create an explosive turn with Ashnod’s Altar or Squandered Resources. As with all decks, sometimes we need a card that will swing the game heavily in our favor or will end the game in one fell swoop. In this deck’s case, we have plenty of options that don’t feel out of place. Ashnod’s Altar and Nim Deathmantle by themselves are already fantastic pieces in the deck. One of the great things about this combo’s inclusion in this deck is that Sek’Kuar acts as combo piece himself. While you will need another card, Sek’Kuar’s ability to produce tokens allows him to loop any effect infinitely to win the game. This extra card could be another piece that is already good on it’s own such as Zulaport Cutthroat, Gray Merchant of Asphodel or one of the cards mentioned earlier in this article, such as Caller of the Claw or Pawn of Ulamog. Even without Sek’Kuar, Deathkeeper, Murderous Redcap, Geralf’s Messenger, or Woodfall Primus can end the game as well. We talked earlier about filling our graveyard full of creatures, and what better way to pull off a win than to pull them all out of the graveyard. With cards like Living End, Living Death, and Rise of the Dark Realms, we get to raise an entire army with just one spell. Ghastly Conscription is another option that I’ll personally be trying out, if only because it’s the fourth card with manifest that I’ve fit into this article. Vicious Shadows and Stalking Vengeance let us burn out our opponents quickly if we’ve managed to build up a board of creatures, especially if we’ve also established Sek’Kuar on the battlefield. Like Ghastly Conscription, Din of the Fireherd is a card I really want to try out because it’s a perfect fit for Sek’Kuar’s ability. 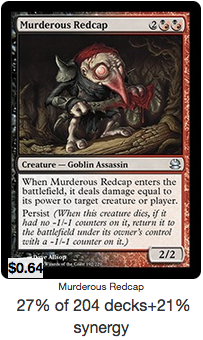 I’m sure “target opponent” will not be as excited to see this card as I am. I’ve really enjoyed brewing Sek’Kuar, Deathkeeper, and I hope I’ve been able to convey my own personal excitement for this commander. I really think he offers a very unique game plan, and that he deserves a second look. Soul of the Harvest, Ulvenwald Mysteries, Fresh Meat, Gutter Grime, Liliana, Heretical Healer, Golgari Germination, Jolrael, Empress of Beasts, Aggressive Mining, Elemental Bond, Nether Traitor, Reassembling Skeleton.